Kenya’s performance in the 2014-2015 IRB sevens series has been abysmal, riven with poor performances largely due to the absence of key players and low morale within the team. For the Wellington sevens however, Kenya welcomed back a number of key players including veterans Collins Injera and Lavin Asego as well as Billy Odhiambo. 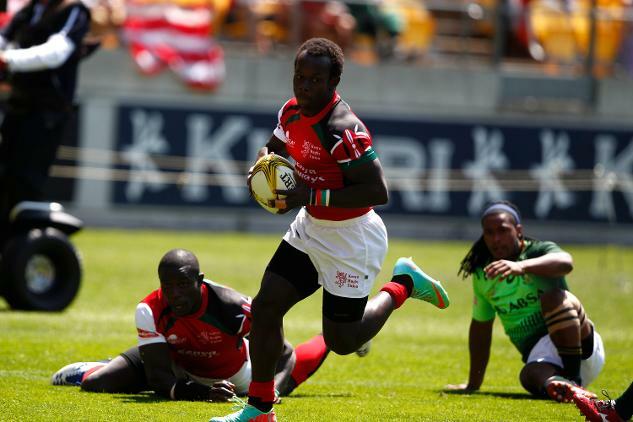 The return of the key players proved crucial as Kenya marched into the quarter-finals. It was Felix Ochieng’s first tournament in charge. Ochieng who played for Kenya sevens between 1999 and 2005 took over head coaching duties after South African Paul Treu quit. Kenya showed some variety in their play with some brilliant diagonal runs, decoys, good linking, support play and shift in direction. This is what enabled them to record wins over Samoa and Scotland. The return of Injera and Asego proved a boon with their experience. A timely interception by Asego resulted in one of the tries against Scotland. Bill Odhiambo, anothe returnee was in fine form, scoring two superb tries against Scotland. Dan Sikuta powered away for the other try after good link up play. Kenya also showed some good commitment to tackling. One area where Kenya must drastically improve is their defensive formation. They allowed their opponents too much space to run at them. This opened up massive spaces out wide because when a player has that much space to run, he often attracts multiple defenders. The Kenyan opponents exploited these gaps. Another area Kenya must drastically improve is in creating turnovers. They allowed their opponents far too much possession. Even Scotland whom Kenya beat had the lions share of possession. In Las Vegas next weekend, they will have to play against England, Argentina and Canada. Argentina is one team that will bury you if you allow them too much possession. Kenya learned this the hard way in Wellington. They will need to improve in this area. This entry was posted in Kenya Rugby News and Commentary, Kenya Sports news and commentary and tagged Billy Odhiambo, Collins Injera, Felix Ochieng, Kenya Rugby Sevens, Lavin Asego. Bookmark the permalink.